“It’s the best method of dust suppression I’ve seen in my 40 years in the demolition business, other than Mother Nature with a heavy rain storm. 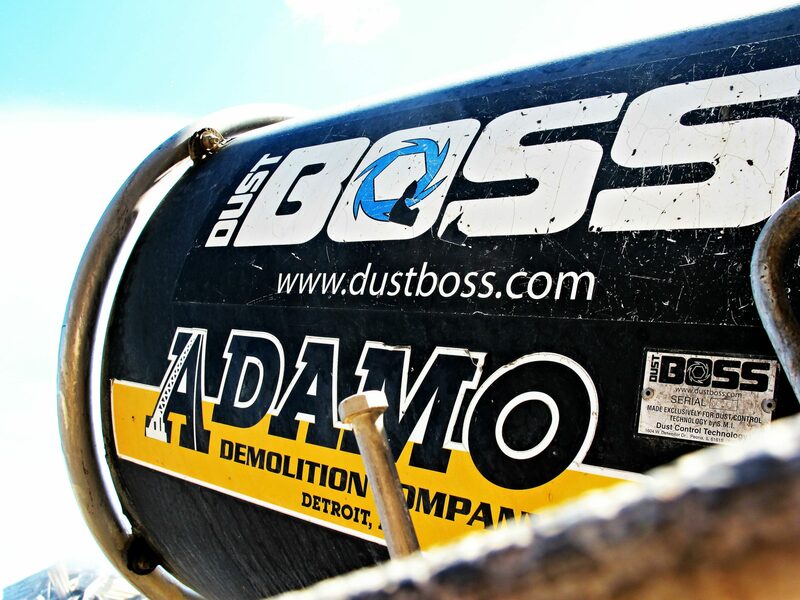 DustBoss has been a long time partner with Adamo on dust control. Adamo specializes in demolition and site remediation, including many of the Midwest's highest-profile projects. The company is recognized as being one of the top demolition contractors in the country, consistently ranking in the top 20 of the nation. 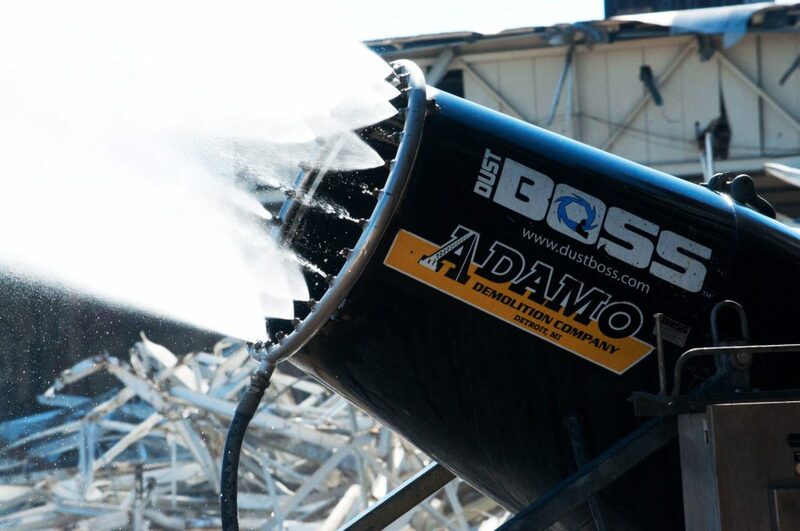 Adamo has been using one of the first DustBoss 60 (DB-60) units to suppress their fugitive dust for many of their demolition jobs. 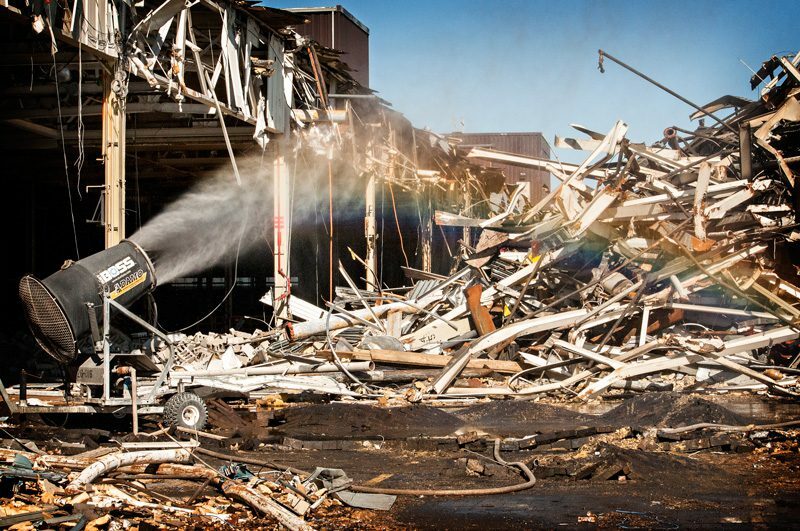 Recently, Adamo has taken on the job of tearing down a used Midwest manufacturing facility while keeping undesirable dust from effecting surrounding work areas. The beginning DB-60 handles their dust control. The durable DB-60 implementing powerful dust control. DustBoss uses atomized mist as its suppression technology. Atomized mist is the only dust control technology that can provide both airborne and surface suppression. The atomized droplets are able to capture fugitive dust since the droplets and dust particles are near the same size. The droplets take the dust to the ground, providing airborne suppression. Once the droplets collide with the ground, the small droplets seal the surface of impact, providing surface suppression. The DB-60 can throw 125,000 sq feet of coverage with 359 degree oscillation, more than two football fields in size. Using a ducted fan located in the back of the cannon to push the atomized mist, the DB-60 extends its throw to 60 meters in length. All mounted to a jobsite ready carriage for easy mobility. 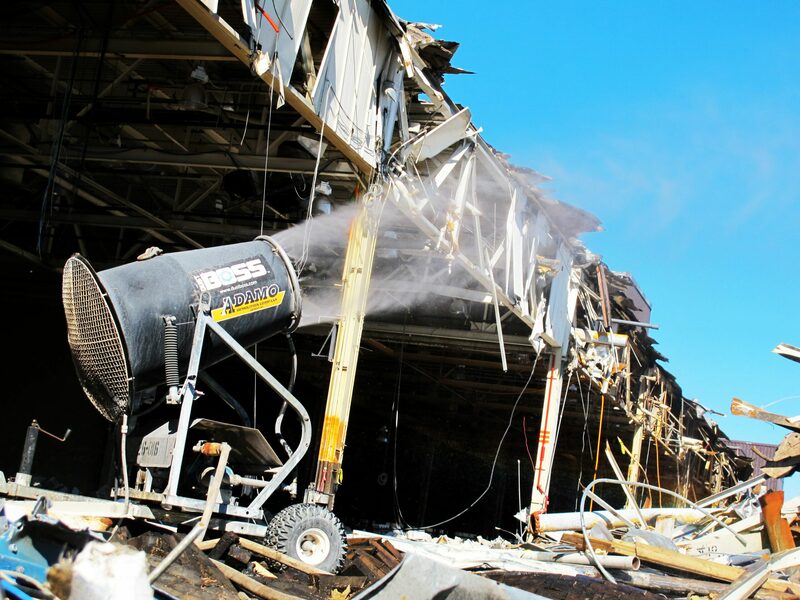 The rugged DB-60 providing dust suppression on unwanted demolition dust. Also available, the DB-60 can be paired with a genset and mounted on a roadworthy trailer to form the DB-60 Fusion. The ideal unit for jobsites lacking a convenient power source. Still running today, the oneset DB-60 continues to suppress Adamo's fugitive dust and doesn't seem to stop anytime soon. DustBoss and Adamo. Partners against demolition dust. Partners for dust control. Adamo Group, a second-generation family business founded in 1964 by John Adamo, Sr., is currently managed by two of his sons, Richard and John Adamo, Jr. Supported by a strong infrastructure of engineers and management professionals, the company has developed into an experienced technical team that advises clients on seemingly endless environmental issues and regulatory mandates impacting demolition projects. John Adamo, Jr. currently serves on the Board of Directors of the National Demolition Association.